Altar Boys - Males from grades 4 & up assist the priest in the liturgical services of the church. Chanter - Our chanters offer the responses at the services and sacraments of the church. Our church currently has one full-time chanter and one part-time chanter but is looking for others to join this ministry, to learn how to offer responses for the services of the church. Choir - Our choir sings on Sundays and at other services throughout the year. Our choir holds practice on Wednesday evenings and anyone interested is welcome to join. Altar Angels - This group of volunteers meets weekly to decorate our church seasonally and help to keep our church clean. Ushers - Our ushers serve at each service to help in the orderly celebration of our worship services. Philoptochos - The Annunciation Chapter of the National Philoptochos is a women’s organization to promote charitable, benevolent and philanthropic outreach, to preserve the sanctity of life and family, and to perpetuate and promote our Orthodox faith and traditions. 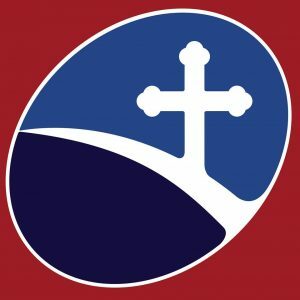 Community Outreach - St. John is affiliated with an interfaith coalition to serve food to the homeless in Tampa Bay once a month on Saturdays, with other opportunities during the year. Food Pantry - Our church operates a food pantry, where we collect and distribute food and clothing to those who are in need, both within our parish and the community at large. Committee for Visitation of the Sick - This newly formed committee will visit the sick and homebound of our community. Stewardship Committee - Our Stewardship Committee is comprised of volunteers who help promote stewardship - time, talent, and treasure - in our church. It is made up of the following subcommittees: Welcoming Committee - The Welcoming Committee encourages new people and visitors to learn about our church. We invite our fellow Orthodox Christians in our community to worship with us and offer a place to serve in ministry. Financial/Fundraising Committee - This committee works on the many financial aspects of fundraising for our church. Included in this are the annual Gasparilla parking, directed gifts, endowments and capital campaigns Manpower Committee - This committee will assist the Parish Council and the various ministries by helping to match up volunteers with needs of the church. Administration Committee - This committee helps maintain the various contact information and mailing lists of the church stewards. Long Range-Planning-This committee will work with the Parish Council to devise a long range strategic plan for our church for its continued growth and progress. Sunday School - Weekly Sunday school classes teach our children about the Orthodox Faith. We are always looking for volunteers to teach our classes and we encourage those with children to bring them every Sunday. Classes are held after Holy Communion is distributed to the children. GOYA - This is our teenage group for young people in 7-12th grades. They participate in a monthly spiritual encounter, social events, retreats and sponsor a Lenten retreat each spring. HOPE/JOY - Youth ages 3 years old through 6th grade come together for spiritual retreats, social events and service projects. Junior Olympics - Our annual athletic tournament for GOYAns from around Florida is held each June on Fathers’ Day Weekend. St. John Chrysostom Oratorical Festival – This is an annual opportunity to give teenagers the challenge to learn, write and speak about their Orthodox Faith, Church and Heritage. It enhances their understanding and appreciation of their identity as Orthodox Christians. Young Adults (YAL) - Our Young Adults - roughly ages 21-40 - meet for a weekly Bible study as well as other social and fellowship activities. College Group - St. John hosts a monthly meeting of college students living in the Tampa Bay area for luncheons and discussions and a retreat each Christmas and in the summer. Small Group Ministry - There are at present six small groups that gather each week to discuss the Bible, Orthodoxy and the Christian life. They are led by lay people and meet in various locations throughout Tampa. Bible Study - A traditional Bible study is offered once a week at the church in the evening. 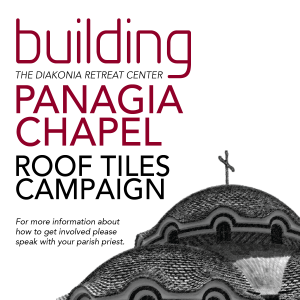 Adult Retreats - The parish sponsors 2-3 adult retreats to enrich and expand our understanding of Orthodoxy. Orthodoxy 101 - This twice yearly series held in the fall and spring each year introduces people to the Orthodox faith, deepening the faith of those who are already Orthodox and sharing the faith with those considering joining the faith. Social Committee – This group will plan all activities relating to fellowship and fun. Volunteers will be needed to set up, serve, and clean up at the many fun events our church family hosts. Adult Greek Language Lessons - We offer weekly Greek language lessons for adults, following a school calendar from approximately September through May. Greek Dance Groups - We have three different Greek dance groups: I Hara Mas dancers are the children’s dance group; the Glendi Dancers are the teenage dance group; and the Panigyri Dancers are our adult dance group. AHEPA/Daughters of Penelope - These two groups – one for men and one for women - promote Hellenic culture and education by having fellowship gatherings and offering scholarships. Greek Festival - Each November, our church sponsors the annual Greek festival, which shares our culture and faith with the Tampa community. Young at Heart - Our “seniors” group meets monthly for a fellowship luncheon and takes frequent excursions to various places around Florida and beyond. Ages 55 and above. The Messenger - The Messenger is published each month by our church. It is filled with theological articles, uplifting messages and the news of our community. The Messenger is mailed to the home of each family. 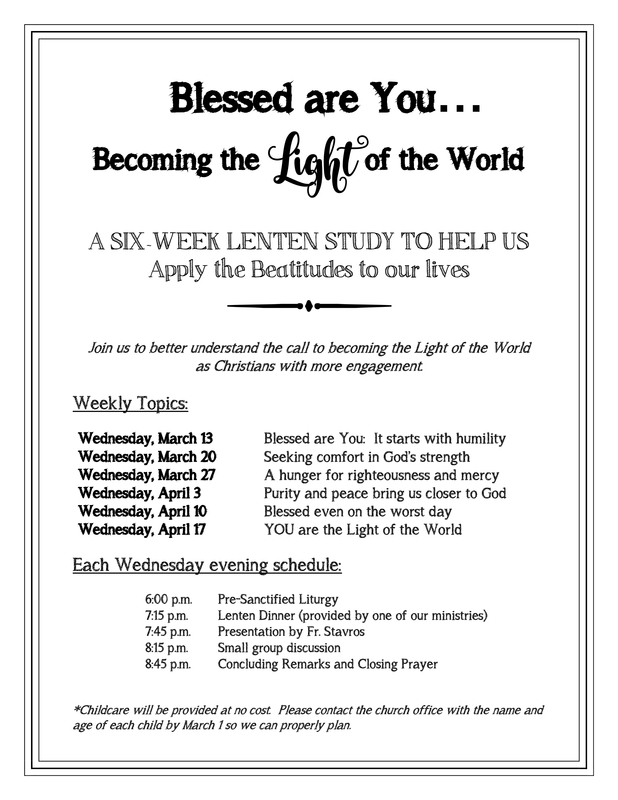 Weekly Bulletin – A weekly publication is copied and assembled in the church office for distribution on Sundays. Internet – The church maintains websites and a facebook page for the community and our festival. You can find news, information, pictures and a calendar of events. Bookstore – Our bookstore houses a supply of books, religious items, icons, and more. It is open on Sundays after the Divine Liturgy. Parish Council - Our Parish Council is comprised of eleven volunteers who are elected from the general membership to work with Father Stavros in administering the parish. Office volunteers – Volunteers are called on to work in the office occasionally to help with mailings and other big projects that need extra help in preparing for distributions.